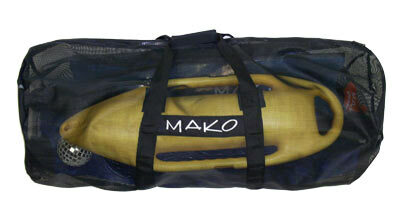 The MAKO Spearguns “Ballistic Mesh” Dive Bag is made exclusively for freedivers. Measuring 41 inches long, it is capable of holding the longest of freedive fins. It is made of a Ballistic Mesh material which is light weight, yet extremely durable. The see through mesh makes accessing your gear fast and easy, even in low light conditions, and it also allows your wet gear to dry out quickly. Also included in this durably constructed bag, is a velcro side pocket for smaller items and the shoulder/hand straps, make for easy carrying. Warning: We do not recommend using this bag by itself when traveling on airlines. Divers often report stolen gear from their bags when traveling on airlines or in remote destinations. Helpful Hint: If traveling on an airline, or in remote areas, we recommend using both MAKO gear bags (Freedive Gear Bag and the Ballistic Mesh Dive Bag). 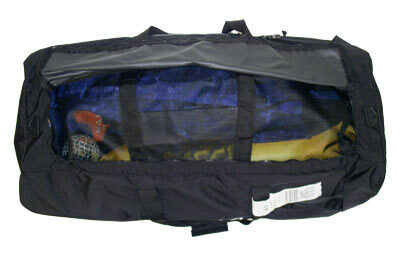 As shown in the photo to the right, the gear is stored in the Ballistic Mesh Dive Bag which is placed zipper size down inside the Freedive Bag. Notice the wetsuit and float is facing up with the smaller and the “easier to grab” items are hidden from view. Also note that to access the gear, the inside Ballistic Mesh Gear Bag must be pulled out in order to access the zipper, thus further reducing the possibility of theft. Sure, the mesh could be cut with a knife, but that would bring attention to the theft and it is much less likely. Another advantage of the two bag system is that the Freediver Gear Bag can used to store personal items as well and be left in the hotel room, while the lighter, mesh bag can be used specifically for the boat or beach dives. Good size and excellent quality. Large bag. I store mine inside of a large storage bin in my vehicle. Keeps everything in place but also allows your equipment to dry effectively. For the price, you can't go wrong. Great quality investment. The bag is insanely HUGE! You can easily fit two sets of long fins, wetsuits, masks, and drybags inside and still have room for more stuff you can think of. The mesh and zipper feel very rugged and tough. It's simply the best deal for a good dive bag you will find and will last for many years of dive trips. The only criticism I can give is that the carry straps are too long in my opinion. If you're a little shorter in stature you will have to carry the bag with a 90 degree bend in your arm to avoid it from dragging on the ground. This can be easily fatiguing when you have 25 pounds of gear inside and have to go on a small hike down the ridge to get to shore.